Your friends will admire you. 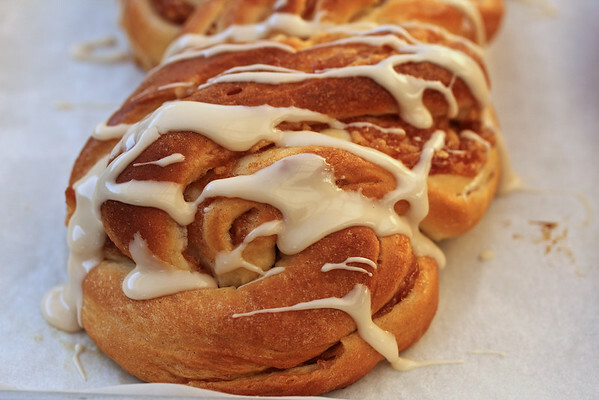 The dough is rolled up like cinnamon rolls, but instead of slicing the rolled up dough cross wise like the rolls, the dough is sliced lengthwise, and then braided, cut side up, to create this gorgeous swirly bread. These loaves would be perfect for breakfast or brunch. You could also leave off the glaze if you want something a bit less sweet. I think it would be awesome as a hostess gift with the glaze on the side. The apple filling calls for Intant ClearJel, which is a thickener that is great to use with fruit pie fillings. I happened to have it on hand (of course I did, because you never know, right?). f you don't have it, you can use flour, corn starch, or tapioca. In the bowl of a stand mixer, mix all of the dry ingredients with a whisk. Add the rest of the ingredients and mix for about a minute until the dry ingredients are wet. Cover with plastic wrap and let rest for 30 minutes. Knead the dough with the dough hook for 10 minutes. The dough should be slightly sticky, so add a bit of water if the dough is too dry. Put the dough in an oiled bowl and spray the top with spray oil. Cover and let rise until doubled, about 90 to 120 minutes. Mix the cinnamon, ClearJel or flour, and sugar in a medium bowl. Mix the apples and lemon in a small bowl. Toss them with the cinnamon sugar mixture. Turn the dough out onto a lightly floured work surface and press it down gently to deflate it. Divide the dough into two equal pieces and roll each into 10 by 12 inch rectangles. Spread the filling over each piece and roll, starting with the 12 inch side, into logs. Cut each log in half lengthwise, and keeping the cut side up, twist the two pieces like a braid, and press the ends together and tuck them under (see the loaf above). Repeat with the second log. Place the twists onto a parchment lined baking sheet, cover with plastic wrap, and let rise until puffy and nearly doubled, about an hour or two. Preheat the oven to 350 degrees F. Bake the loaves for 30 to 35 minutes. Cool on a wire rack for about an hour before glazing. Using a fork, drizzle the bread with the glaze. This recipe was slightly adapted from King Arthur Flour and is the recipe that the bakers of the Avid Bakers Challenge are making for October. Looks better than bakery made! Oh thank you so much Medeja! This looks fantastic, Karen! Really just fantastic! Susan, you made my day! Love the idea of a hostess gift with the glaze on the side! I am so behind in commenting on postings this month. I just looked at everything you made in October so far, and I am salivating over each one! That pizza looks amazing, your squid stir-fry is gorgeous, and the pastries look wonderful, to mention a few. 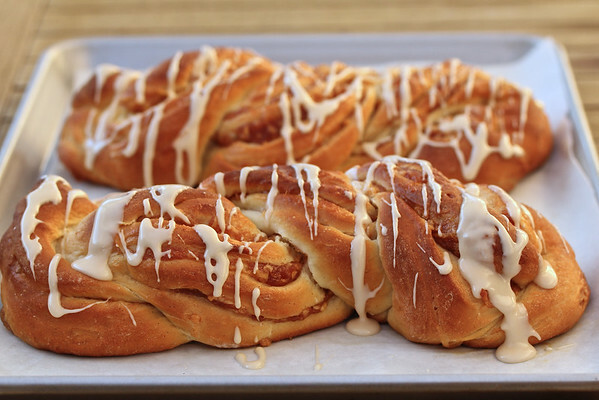 What a great idea of giving this beautiful apple twist bread as a hostess gift with the glaze on the side? It's also reassuring to see the bread turning out just like the one on the King Arthur website. Beautiful loaves, Karen, and, after I read about others having issues with a too wet filling, I'm glad I had Instant ClearJel, too. Thanks Karin. It sure made it much easier to handle. I bet it's great with blueberries. Beautiful loaves Karen! The glaze drizzle makes it look so festive. Glad to hear that the clear jel worked for you as well. The loaves look wonderful. The braids perfect!! Karen, I made it today (still in the oven) but it was big mess to put braids together. The apple filling was very watery so when I cut loafs and tried to braid them the filling was everywhere. My loafs are sitting in a pool of apple juice now :-) I expect bottoms to be burn little bit. Should I have drained apples before making filling? I think the loafs still will be delicious, thank you for the recipe! Hi Elina, I'm sorry it was so runny! I did use the instant clear jel, which prevents it from getting runny. Draining might be a good idea. I hope that you did enjoy the bread! Thanks so much for commenting! Hi Karen, the bread was delicious and it didn't burn. Somehow it all worked out at the end. I used tapioca flour because I didn't have the jel. Next time I will drain apples or get the instant jel. Thank you!! !